Courtney Carver has helped hundreds of individuals create more simplicity in their lives through her tiny wardrobe tours, and recent book events. Courtney demonstrates how the power of simplicity improves our health, builds more meaningful relationships, and relieves stress in our professional and personal lives in sold out events across the country and invites us to close the gap between inspiration and action. Below are Courtney’s most popular speaking topics. Custom content for your audience can be created upon request. Let’s be honest: sometimes, being busy makes us feel better. If we’re busy, it’s easy to feel that we matter more, right? But I’ve found that staying busy can keep us from focusing on what really matters, true productivity, meaningful work, and sometimes even knowing ourselves. It’s easy to hide behind busyness as a distraction from the GOOD work of our lives. In this presentation, Courtney helps audiences recognize their busy triggers, identify ways to more productively and proactively boycott busy for improved clarity and meaning in their work and in their lives. It’s high time you create the space and attention for what matters most to you at home and at work by eliminating needless decisions, meaningless clutter, destructive relationships and anything else standing in the way of a life that makes you smile 99 times a day. Be more with less is about simplifying your life and really living. In this presentation Courtney will walk audiences through how living with less creates time and space to discover what really matters. Through decluttering, and focusing on the best things instead of all the things, the audience will learn to create a life with more savings and less debt, more health and less stress, more space and less stuff, and more joy with less obligation. “If you can get Courtney’s message in front of your people – written, spoken, in pictures, or otherwise – do it. Her compassionate, eloquent, and always practical guidance crosses almost all cultures, languages, and eras. 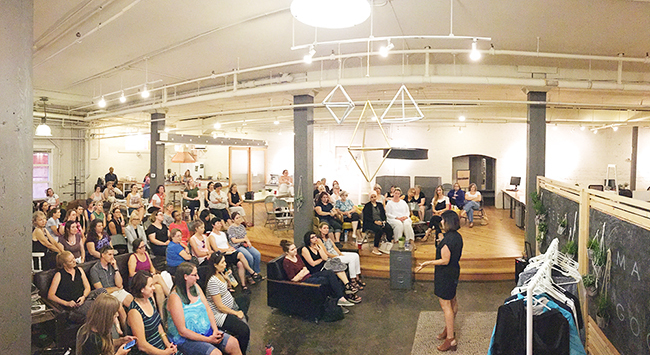 And from an event organizer’s perspective, she gave me and our shared community everything we wanted, plus the energy and connection we didn’t know we needed until she generously shared it. Concise or story-filled, from one topic to another – I’ve yet to meet anyone who thinks Courtney’s words and warmth are anything less than fantastic.” – Joel Zaslofsky, from SimpleREV. SXSW 2013: How Minimalism is Changing Entrepreneurship. Tiny Wardrobe Tour: See tour dates and cities here. To speak with Courtney about a speaking opportunity for your group, please email courtney@bemorewithless.com.